Especially in a time where franchises are getting only more complex, more bloated, it is interesting to consider the evolution of such a hugely successful movie series as The Fast and the Furious. Originally a comparatively “small” franchise focused exclusively on street racing, it has ballooned into an insane, globe-trotting mesh of spycraft and ensemble drama. I have only seen the previous incarnation of this series, Furious 7, but it is clear that the franchise has become much more (for better and worse) than its humble origins: from box office alone, Furious 7 grossed twice the amount of its predecessor, for more reasons than the untimely demise of franchise star Paul Walker. So what step in the series’ evolution does The Fate of the Furious take? Quite simply, it doubles down on the core, car-fueled action. While the previous installment featured no small amount of hand-to-hand combat and gunplay (even bringing Tony Jaa for a fairly small role), Fate is, for better or worse, focused on races and chases. As a result, the movie more than delivers on the requisite amount of vehicular destruction across several countries and types of terrain. 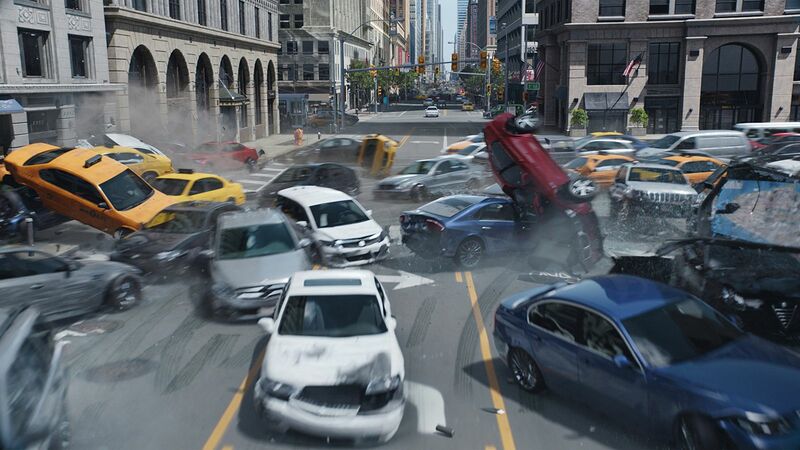 This is most apparent in the pre-title sequence, a straightforward-turned-explosive street race that takes place between Dominic (Vin Diesel) and a Cuban crime boss. It involves the first invocations of family, the overarching emotional concept that has come to dominate the franchise, but it also serves to ground Dom in a certain code of honor that strongly influences his actions throughout the film. Soon after, he is forced into helping Cipher (Charlize Theron), a mysterious cyberterrorist, acquire an EMP. In the process, he betrays his crew of street racer criminals—including his wife Letty (Michelle Rodriguez)—and his government agent friend Hobbs (Dwayne Johnson). All of this fairly convoluted plotting is handled with a fair amount of finesse, using relatively long sequences of dialogue without ever really sacrificing the viewer’s interest (thanks to some quite funny one-liner deliveries from a good portion of the cast). The explosions and chases come with a certain frequency, but the most important aspect to director F. Gary Gray and the ensemble, it seems, is the ultimate stakes of the film. As might be expected, the eventual climax is centered around saving the world, but it is even more important to the crew to reunite their family and bring Dom back to the fold. Of course, this emotional grounding is by and large an excuse to get to the insanity, and there is much destruction and stunts to be had. 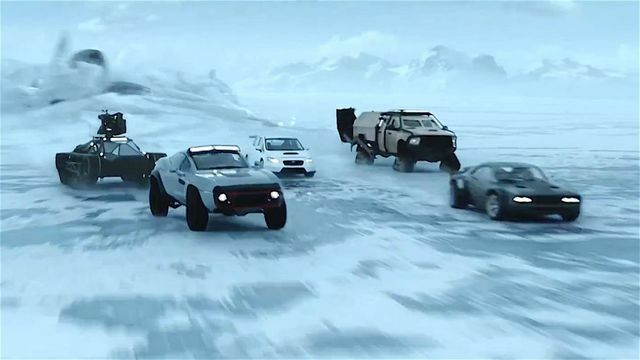 There is nothing quite as crazy as cars jumping from planes a la Furious 7, but various scenes involving remote-controlled cars and the climactic chase on an ice field in Russia escalate in ludicrousness with wonderful unpredictability, and even the scenes not involving gigantic explosions—a prison riot involving Hobbs and villain-turned-antihero Deckard Shaw (Jason Statham), an assault on an armored limousine, a plane-jacking—provide no shortage of pleasure. The Fate of the Furious is by and large disjointed and almost too loving of its heroes, but it certainly cannot be accused of straining for any measure of self-seriousness. All of the cast and crew seem to have realize that if ever there was any semblance of realism, it is long gone, and thus they embrace the ham-fisted allusions, the insistence on family, the ridiculous destruction. More power to them.